When the schedule first came out showing an Eagles – Chiefs matchup on the road in Week #2, many figured that the Eagles would have a tough time winning in Kansas City. Most also assumed that the contest would feature the passing game since both head coaches (Andy Reid and Doug Pederson) like to pass the ball almost as much as Congress likes to pass the buck. But in a game that was there for the Eagles taking, their coach’s reluctance to incorporate any semblance of a running game into the offense eventually became the difference between a win and a loss. Kansas City coach Andy Reid, who is as likely to run the ball as he is to run a marathon, actually adjusted his game plan in the second half to feature a more balanced offense and take the pressure off of his quarterback, Alex Smith, who was getting pummeled by the Eagles defensive line in the first half. This adjustment led to the Chiefs eventually breaking a 13-13 4th quarter tie and taking a 27-13 lead before holding on to win, 27-20. And who says that old dogs can’t learn new tricks? Looks like “Big Red” has actually gotten wiser with experience, though I wouldn’t hold your breath and expect him to run the Boston Marathon against some speedy Kenyans anytime soon. There were a lot of positive vibes to take from this Eagles’ loss. The team held its own quite admirably in a hostile environment against an opponent that has a legitimate chance to make a run at the Super Bowl. And the Birds defensive line once again came out strong, limiting the Chiefs offense to 13 points through three quarters. The blame for this loss belongs solely on the coach’s shoulders in my opinion. Regardless of what he may think he sees schematically, dropping back with the intent to pass on 56 of 69 total plays (an 81% pass/run ratio) will do nothing but get your quarterback killed. In the coach’s defense, he does not yet have a reliable running back that he can count on to carry the load. Free agent LeGarrette Blount looks somewhat lost in this offense, and it could be that his best days are behind him. Wendell Smallwood has come up “small” so far this season (no pun intended) and Darren Sproles, while being the only effective running back in last week’s game (10 carries for 48 yards), is best utilized by being used sparingly at this juncture of his career. Another area of blame for the lack of a running game is the offensive line, which has not done its job of opening holes for the running backs. Perhaps running back Corey Clement , the local kid from Glassboro, NJ who made the team as a rookie free agent and is the Eagles “feel good” story of the year, needs to be more involved in the offense. Or perhaps Dougie P. needs to stick to running the ball even when it doesn’t seem to work in the first three quarters of the game, in the hopes that it will wear down the opposing defense, eventually leading to sizable yardage come the 4th quarter. While I’m not suggesting that a 50-50 run-pass ratio is what’s needed in today’s NFL that is geared toward the passing game, an 81% pass to run ratio when you are in a tie game in the 4th quarter should be worrisome for a head coach who has aspirations to build a championship team in Philadelphia for the long-term. 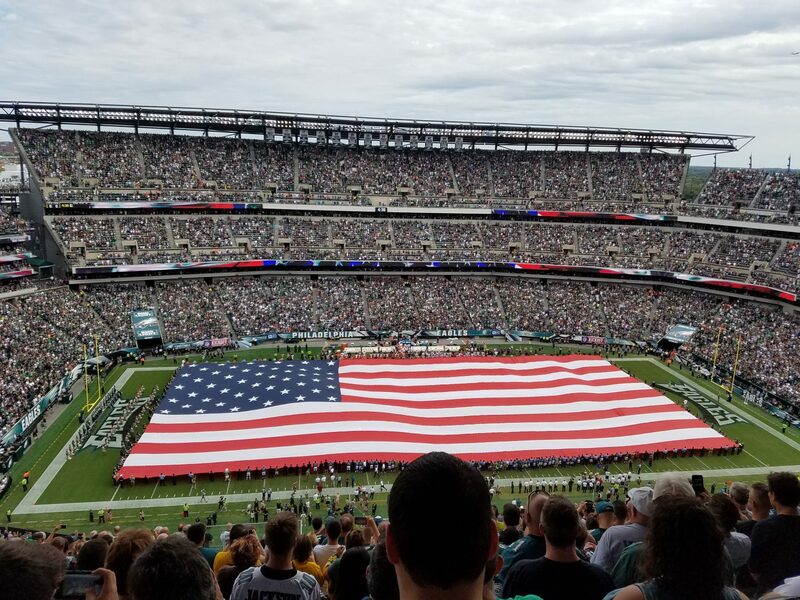 This week, the Birds return to the friendly confines of Lincoln Financial Field for their home opener in an NFC East joust against the New York Giants. The New Yorkers’ have staggered to a 0-2 start, mostly due to their offense looking more like “lilliputians” than Giants. The G-Men have scored a total of 13 points on offense, while their quarterback, Eli Manning, has been sacked a total of eight times thus far (contrast that with the Eagles, who have scored a total of 42 points on offense after two games). The Birds would do well to apply continuous pressure on Eli Manning, causing him to get that usual bewildered look on his face (you know, the one where he looks like a squirrel in the middle of the road who’s just realized that there’s an oncoming automobile barreling toward him). Even with the Giants offensive troubles, they still have a potent weapon in wide receiver Odell Beckham, Jr., who can wreak havoc on a depleted Eagles secondary if Manning has time to deliver him the ball. Regardless of the Giants problems on offense, they still have a solid defense, and these NFC East games are rarely comfortable wins. Expect the natives to be nail biting and restless into the 4th quarter, with some anxious moments for “Beak” (the guy in my section who wears an Eagles beak to each home game). But have no fear – Birds win 20-16, and all the faithful, including Beak, go home happy. This entry was posted in Eagles, football, NFL, Sports, Uncategorized and tagged Andy Reid, doug pederson, New York Giants, Philadelphia Eagles. Bookmark the permalink. ← As Broad & Pattison Turns Week #2: The “My Tutor” Game.